Transaction Log buffers; How is txlog write latency hurting SQL Server? Its been a while since I looked at 'dbcc dbtable' lc_state values to see how close a database is to experiencing log buffer waits. I wrote a stored procedure to grab the info at 5 minute periods, investigating the effects of synchronous SAN replication for transaction log LUNs. But that was back in January 2014, and the instance was SQL Server 2008 R2. Today I was poking around in SQL Server 2016 and noticed that lc_state values are more friendly! I'll capture all 7 of the new(er) text values and then create a whole new blog post about this. 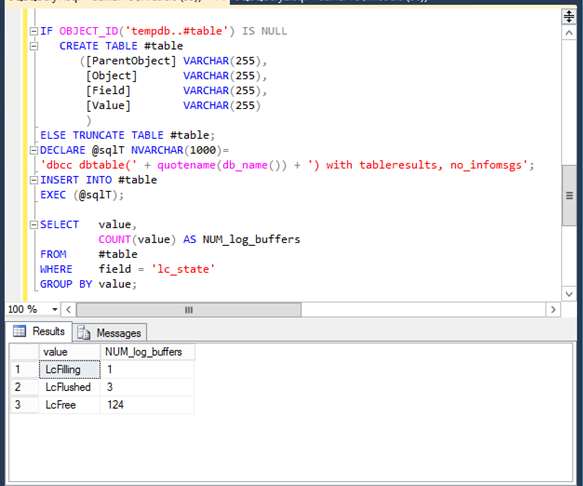 A colleague that was working with my January 2014 SP to capture this information told me that even in SQL Server 2012 lc_state was assigned a text value rather than numeric 0-6. Oh well. Don't pay too much attention :) I'm just trying to work this out. I've mentioned a high write latency SQL Server instance before, and captured two LUNs for that instance that stay pretty close to pegged at "current disk queue length" of 32. You can see some of that fun here. I was able to find a couple of sources on the web that mentioned both the maximum 32 outstanding async writes per txlog, and also mentioned that the total number of in-mem buffers was higher (128 total). Paul Randall was nice enough to tell me that I could check on free txlog buffers by getting tableresults from 'dbcc dbtable(db_name()) with tableresults' (if you do it in master without specifying db name you'll pull in results from all databases - it'll be extensive). SQL Server 2008 R2. Here's what I think is happening. lc_state=0 is a zeroed, free, ready to become current buffer. Under pressure there may not be a buffer of state 0 at all. But, in a database idle since SQL Server startup, I've seen 127 buffers of state 0 and a single state 1(all of the buffers initialized and zeroed at startup). At startup all buffers are initialized and zeroed... but once they've been written once (lc_state=5) they are marked free (lc_state=6) and only zeroed one at a time on demand. That would be similar to how Windows and other OS handle RAM which needs to go on a "zeroable" list, and then zeroed, before being allocated to another use. lc_state=2 are full buffers. At the next trigger, they'll queue to be written and when the log writer can write them it will. lc_state=5 are currently outstanding writes. At a trigger (such as commit or checkpoint) the logwriter will call for up to 32 buffers to be written asynchronously. Due to the total limit of 3840 kb of outstanding writes for the logwriter, there may be less than 32 writes sent even if there are 32 or more ready to be written. Or, there may be less than 32 buffers ready for write when the logwriter trigger (commit, checkpoint, etc) occurs. lc_state=6 is write complete, free, ready to be zeroed. But these are only zeroed on demand - that's why there's never more than 1 lc_state=0 (free, zeroed, ready to become current). So I don't have a clue yet about lc_state=3 or lc_state=4. If I've correctly deduced the meaning of the txlog buffers, and the "on demand" zeroing of one buffer at a time from the "zeroable" list of previously written buffers... zeroing only 1 buffer at a time could be a bottleneck during heavy (optimized) ETL or other high change rate activity. In this case, I think I may also have to monitor the 3840kb total limit for tx log writer async writes. There's two busy user databases, tempdb is getting some activity... and I think there's one more database generating some activity. So at some times, the 3840kb total txlog async write limit may also be throttling activity. Ehhh... its a rough draft... but if I don't post this tonight it'll stay in my head for a really long time. Someday I'll loop back to this and robust it up. I'll include a link here when I do. Maybe it'll help someone even in the state its in. Here's the setup: you are dropped into a new organization, without the previous DBA to ask questions. And there is an upcoming SQL Server storage migration. What then, huh? a. current levels of concurrent activity, or is concurrency growth expected in the service life of new storage? b. current levels of quarterly/annual data growth, or growth pace increase expected? c. are current read latencies acceptable, or is there a new target? 2. If a test run of production workloads is possible in a test environment, it can be very useful for information that can be too expensive to gain production observation. It was extremely useful for us to reproduce production workloads in a test environment using procmon to capture sequence, operation (read/write), offset and length. Using that information we were able to determine the distribution of read and write sizes and also estimate the number of sequential (or at least highly local) IOs versus nonsequential or random IO. Evaluating this type of data in a database loaded with and without the -E startup parameter really helps evaluate whether it would be meaningful or not. The presence or absence of sequential 512k reads also helps to evaluate whether increasing the HBA maximum transfer size would be meaningful or not. Analyzing these log files also helped create a profile of read and write sizes for storage stress testing. Creating verbose log files can have significant observer overhead, so latency numbers from this type of profiling may not be meaningful. But being able to determine a distribution of sizes and data locality was priceless. Here are some examples of capturing this type of data. I've settled on a 15 second interval for most uses. Occasionally I'll use 30 second intervals, but I tend to stay at 15 or 30 seconds. This is largely because I work with SQL Server systems and Oracle on various *NIX flavors. Outside of Windows I stick with 15 or 30 seconds so I can capture data at a smaller interval than the filesystem sync daemon fires. And by keeping both my Windows perfmon and *NIX collection intervals at 15 or 30 seconds, I can meaningfully compare data from different platforms that happen to be on the same SAN. Anyway... here are the perfmon counters I recommend for profiling. I usually capture perfmon logs for at least two weeks. That way truly anomalous system activity or behavior might be identified and maybe not lead to wasted time. Whether perfmon is collected for many full days, or in more targeted, shorter lengths of time, cover as many bases as possible. 5. OK, ya get yer perfmon! Now what? The numbers mean the most in correlation to each other. I've got lots of graphs that I use frequently - all with clock time on the x axis. This works best as two graphs just because scaling techniques are needed to get reads/sec and read bytes/sec onto the same axis. Is sec/read, the read latency, more strongly correlated to the number of read IOPs or the read bytes/second? This works best as two graphs just because scaling techniques are needed to get writes/sec and write bytes/sec onto the same axis. Is sec/read, the read latency, more strongly correlated to the number of write IOPs or the write bytes/second? If read and write latency are more correlated to total disk transfers/sec than to the rate of the respective operation, storage controller CPU may be overloaded. Alternatively, a target front end adapter port queue depth may be getting overrun. If read and write latency are more correlated to total disk bytes than other factors, the bandwidth in bytes somewhere may be getting overrun. When SAN connections to individual disk devices were nearly always FC-AL loops, a flood of traffic for one disk on the loop could starve traffic for other disks in the loop. Windows allows a maximum of 256 outstanding IOs per Windows volume. That includes both the wait queue depth managed by Windows and the service queue depth (typically 32) managed by the multipathing software and/or the HBA driver. Keep it pegged at 256 and both read AND write latencies will suffer, even with VERY fast disk devices underneath. Now a word about the service queue depth: keep it pegged, and write latency especially will suffer. Cached writes are typically quite fast. But if writes are stuck in the (usually) FIFO wait queue with the entire service queue filled with reads, write latency may exceed read latency. That can be a sign that service queue depth may need to be increased (per best practices of storage vendor), or more Windows host LUNs are needed for the workload, or that an increase in HBA maximum transfer size may be beneficial. If current disk queue length seems to remain high, is it because of read IOPs, write IOPs, or transfers/sec? 6. Now what? Well... compare the expected host-level configuration of the new system and the current system, to make sure that its an apples to apples comparison. a. data layout. Paging space on Windows install drive, or isolated to its own drive. (I like isolating to its own drive: IMO it is by far the easiest way to monitor paging activity. It also insulates the OS install drive from a potentially crushing amount of activity under heavy paging.) Same number of host LUNs for mdf & ndf data files? Same number of tempdb files & LUNs? Same plan for transaction log files? b. NTFS cluster size - 64k on both systems? c. Windows volume offset - same offset, or at least aligned offsets on both systems. e. multipathing setup: Windows mpio, EMC Powerpath, Hitachi hdlm, ?? What is the multi-pathing algortihm? g. SQL Server options that can influence IO behavior, eg -E startup parameter (4mb parcels instead of 64k for proportional fill algorithm), trace flag 1118 (no more table or index mixed extents), trace flags 2562 or 2549 (altering dbcc checkdb behavior), or parameters affecting SQL Server backup behavior. OK... now you're ready for stress testing the new rig, with an understanding of current system performance capacity and behavior and the comparison of the old and new host configuration.